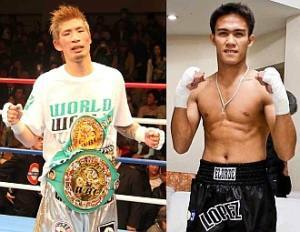 Filipino world title challenger Sylvester "Stallone" Lopez and manager Gabriel "Bebot" Elorde can breathe a sigh of relief as the WBC has named a panel of neutral well-known officials for Lopez's upcoming title clash against the reigning Japanese super flyweight world champion Yota Sato this coming Sunday (July 8th) in Yokohama, Japan. The officials are: referee Laurence Cole of Texas, USA. The three ringside judges are Dr. Louis Moret of Los Angeles, California; Omar Mintun of Tamaulipas, México and David Bilocerkowec of Alberta, Canada. Supervisor is Frank Quill of Melbourne, Australia. Referee Laurence Cole has worked in some fights in which pinoys have emerged victorious like the Manny Pacquiao-Antonio Margarito and the sixth world title defense of "Lindol" Luisito Espinosa against Mexican Juan Carlos Ramirez. Also, in the first Pacquiao-Juan Antonio Barrera clash. In addition, the controversial Andre Dirrell's win over Arthur Abraham was refereed by Cole as well as in the recent victory Julio Cesar Chavez Jr-Andy Lee middleweight fight. Judge Dr. Louis Moret, whom this author met last year in southern Thailand, has been the referee in the Pongsaklek Wonjongkam-Takuya. The veteran Moret also worked as the third man in the second Abner Mares-Joseph Agbeko (the one without the continuous low blows), in the Wladimir Klitschko-Chris Byrd and the Shane Mosley-Oscar De La Hoya fights. He also judged in the Ray "Boom Boom" Mancini-Livingston Bramble fight. The second judge, Canadian David Bilocerkowec in his 8th year as a boxing judge has officiated in world title fights as the Saccurato-Mrdjenovich, the Torres-Yamaguchi clash in México and the Saul "Canelo" Alvarez-Kermit Cintron also in México. The trio of judges is completed with the experienced Omar Mintum of México who has worked in thrilling world title combats as the Mike Tyson-Frank Bruno, Tommy Hearns-Iran Barkley, Larry Holmes-Lucien Rodriguez and more recently in the Carl Froch-Jermain Taylor and the Timothy Bradley-Devon Alexander clashes among others. 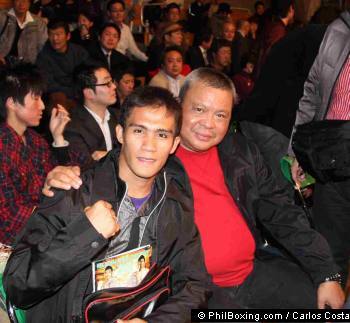 Lopez (L) and his manager Bebot Elorde at ringside during Sato's last fight in Japan.